The Dinner Party is a genuinely intriguing play partly because the premise is a very imaginative twist on an old stalwart. A standard Agatha Christie device (a la ‘The Mousetrap’ and ‘Ten Little Indians’) finds a random group of essentially middle class individuals all invited to a party by an unseen host and old dirty secrets are gradually unfolded. Interestingly, the playwright Neil Simon farced this idea in his screenplay for the film ‘Murder by Death’. With The Dinner Party there is no murder mystery; no under-cover murderer or detective masquerades as a guest and no crime has been committed. This does not mean however that the secrets to be unfolded are not of an excruciating nature and that some surprising interpersonal relationships are revealed, making this a complex play which leaves the audience thinking. The Dinner Party is also a challenging piece because the mood moves markedly from near-farce to almost tragi-drama, and in a play like this careful handling is needed to carry the audience on this emotional rollercoaster. 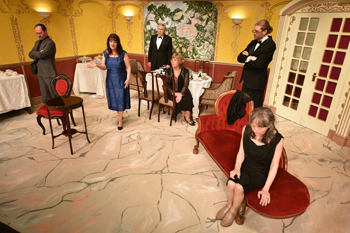 Director John Chidgey has moved the play along well without for the most part any loss of pace as the story ebbs and flows between comedy and drama in a genteel backdrop. The background set perfectly complements the mood of middle class respectability, with notable attention having been paid to a pleasing marble effect floor. Neil Simon was himself married five times (including two times to the same person) and so had a lot direct source material to write a play about past failed relationships. There is something Poirot-esque the way the causes of failed marriage are given and then later re-assessed from different angles. The play never gets too heavy though and for the most part is very funny, affirming Simon’s reputation as a skilled playwright. Each of the six characters has a story to tell and the fallout from past relationships comes over convincingly, at times in a touching way with real feeling. The cast bring over six very different personalities who visibly change as they are forced to deal with their respective pasts. John Westbrook as Albert is particularly amusing as a man with carefully constructed defensive emotional walls which ultimately prove wanting, and Kathryn Fennel as Gabrielle presents an entertaining portrayal of a woman seeming in complete control until emotional cracks come to the fore. Emily Duffy is a nice contrast as Mariette, an apparent wall-flower hiding inner fire and Christine Perry as Yvonne has some beautiful exchanges with her ex. Arthur Hulse is almost the ‘straight man’, trying to maintain a strong stalwart indifference to other’s machinations, juxtaposed to the more outwardly vulnerable Claude played sensitively by Steve Cunio. Towards the end of the play, some chances to heighten the drama are missed a little as we see certain characters undergo changes of heart. A bit more dynamic emotion would have been in order as the plot twists and turns, the absence of which does weaken the pace a little at times but overall, the interest of the audience is held right up until the captivating last line; you really are kept guessing what will happen until the last moment. The Dinner Party is a funny and very well-written play dealing with difficult issues to which by and large the cast have done full justice. 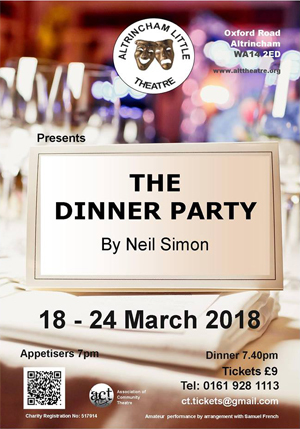 The Dinner Party is on at Altrincham Little Theatre until Saturday 24th March.